Cabinet passed the Real Estate Regulation and Development Bill 2015 recently which will now be presented in the Lok Sabha. We list some of the key highlights of the bill which will affect both Home buyers and the developers of the Real Estate. These guidelines are aimed at creating a Real Estate Regulatory Authority on the lines of SEBI (for stock markets), TRAI (for Telecom Services) which will place controls and checks to ensure timely delivery of projects by developers. The regulator will protect interests of the consumers and promote fair play in real estate transactions by addressing the complaints of the public with respect any developer in the country. The Bill includes provisions to ensure uniformity in regulations and thus ensuring an environment for speedy adjudication of disputes and orderly growth of the real estate sector. The clarity which the bill brings in will also boost domestic and foreign investments in the Real Estate sector. Government aims to achieve its objective to provide ‘Housing for All’ by removing hurdles in the sector through this bill. The Bill also mandates compulsory disclosure by the promoters of a real estate project to the customers by registration of real estate projects and its agents with the Real Estate Regulatory Authority. Real estate sector has been in poor light due to various reasons, this bill aims to bring back confidence in the sector by institutionalizing transparency and accountability in real estate and housing transactions. This in turn will further enable the sector to access capital and financial markets. The Authority formed post this aims to promote orderly growth in the segment by ensuring efficient project execution, professionalism and standardization. 1. This bill is applicable for both commercial and residential real estate projects. 2. 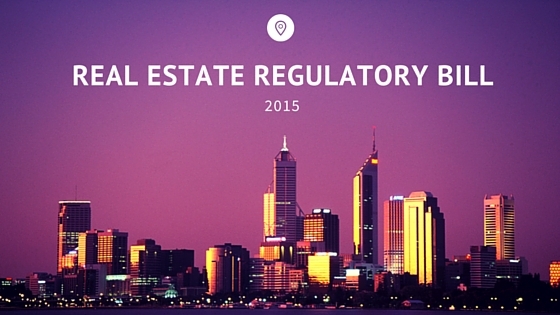 ‘Real Estate Regulatory Authority’ will be established in States/UTs to regulate real estate transactions. 3. It mandates Registration of real estate projects and real estate agents with the Authority. 4. It will be compulsory for all registered projects to disclose details of the promoter, project, layout plan, land status, approvals, agreements along with details of real estate agents, contractors, architect, structural engineer etc. to the authority. 5. A separate bank account to be created and the construction cost of the project to be deposited in this account to ensure timely completion of the project. 6. Fast track dispute resolution mechanisms to be established for settlement of disputes through adjudicating officers and Appellate Tribunal. 7. Civil courts will be prohibited from taking up matters defined in Bill, however, consumer court allowed to hear real estate matters. 8. Promoters of the project will be barred from changing layout plans and project designs without consent of consumers. 9. There is provision for the Appropriate Government to make rules for the matters which are specified in the Bill, and the Regulatory Authority to make necessary regulations to ensure orderly growth of the sector. What do you think about this bill, do share your comments below.